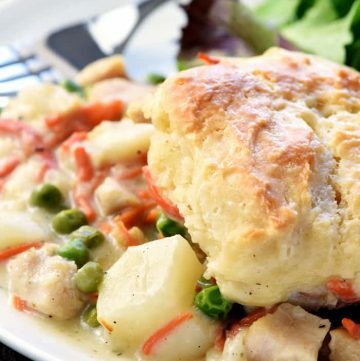 Chicken Pot Pie Casserole features a classic filling of tender chicken, potatoes, carrots, and peas in a savory gravy topped with fluffy homemade drop biscuits! 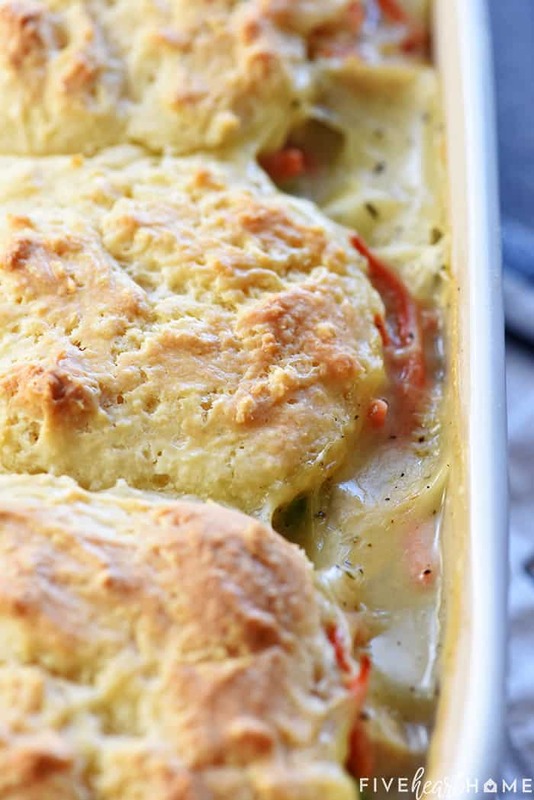 Hearty, homemade comfort food…that’s what we’re talking about today, friends! 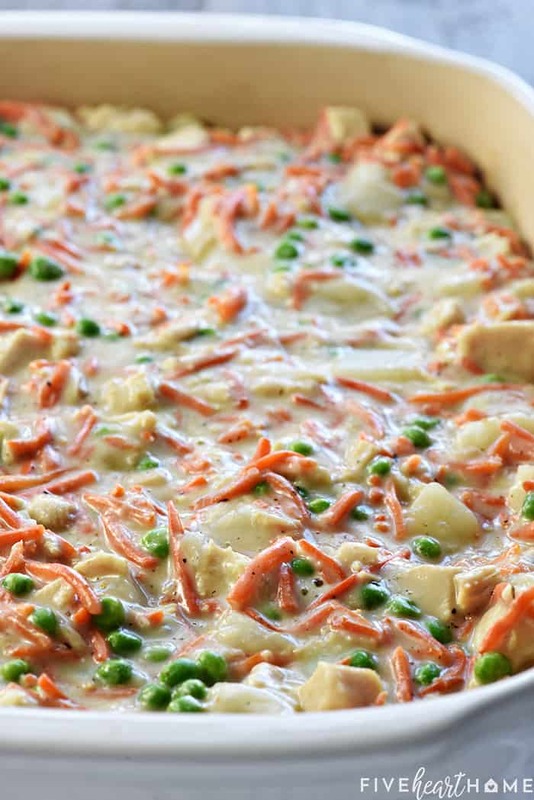 And because comfort food doesn’t get anymore comforting than chicken pot pie, I’ve decided to take things up a notch with Chicken Pot Pie Casserole! Now what exactly is the difference between the two, you may be wondering to yourself right about now. Well, allow me to explain! 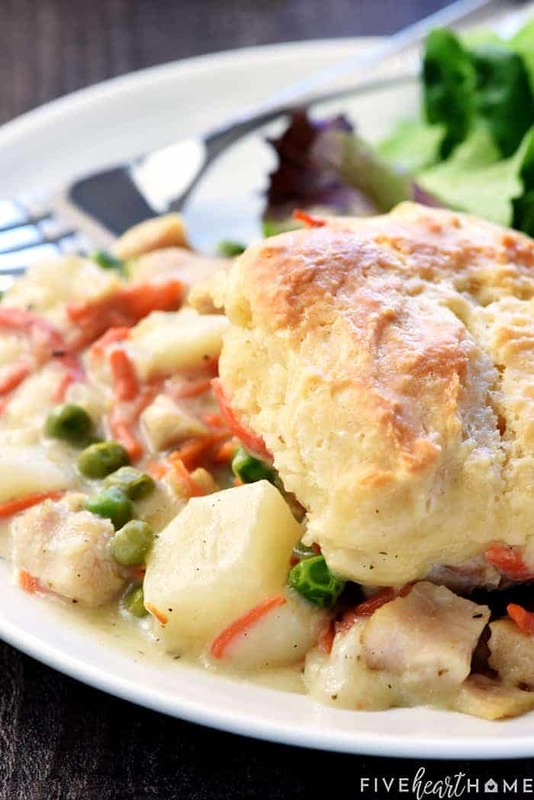 Chicken pot pie, as its name indicates, involves a flaky, golden crust…a pie crust. And it’s absolutely divine. 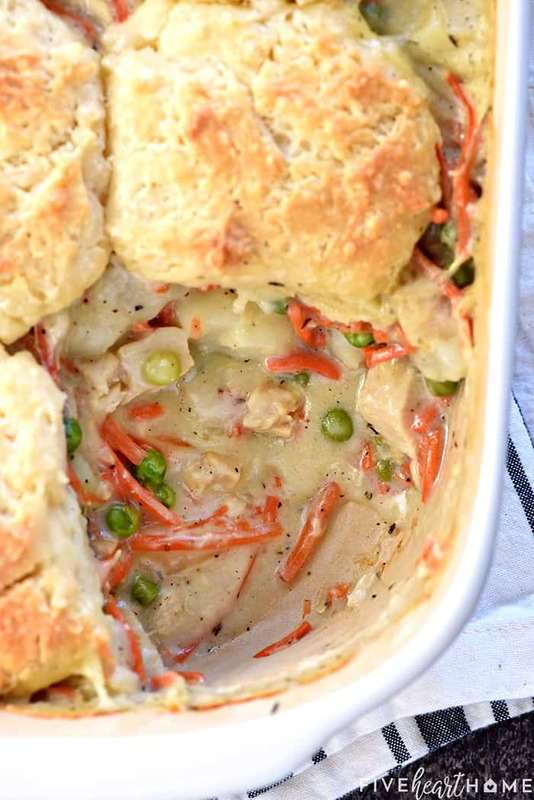 But since I’ve already shared my beloved, most-favorite Chicken Pot Pie recipe (topped with my beloved, most-favorite all-butter pie crust), today’s recipe is something a little bit different. 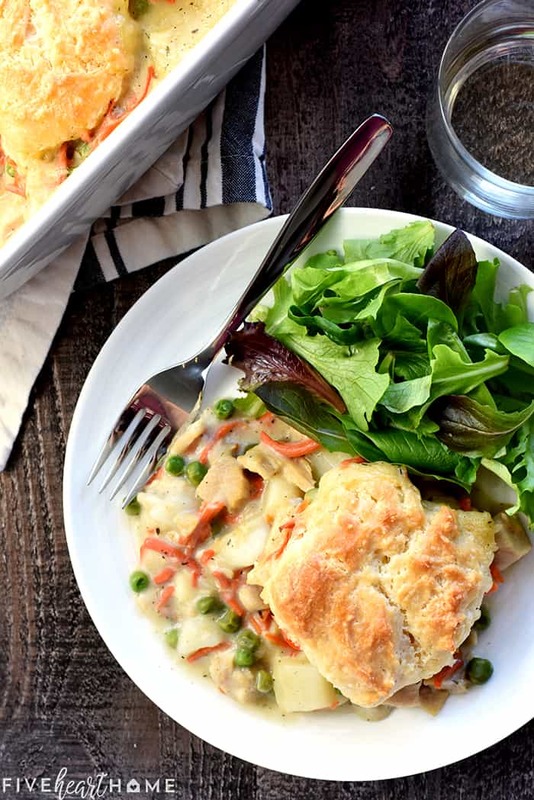 First off, today’s Chicken Pot Pie Casserole feeds a crowd. Seriously…there are like a dozen servings here. 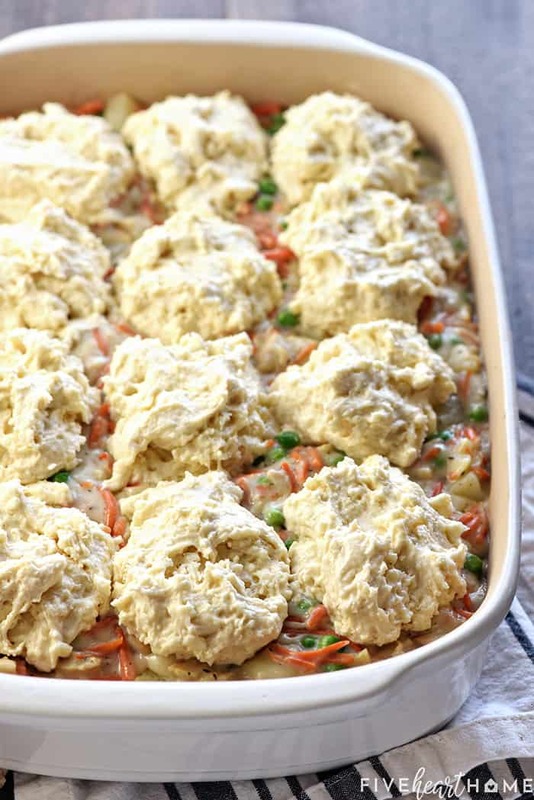 I suggest making this recipe in a big ol’ baking dish, akin to the size you’d use for lasagna. I made mine in an extra-deep 9X13-inch dish, but the filling came all the way to the top…I’m lucky it didn’t overflow! So next time I’ll make it in my big, deep, 5-quart baking dish that I use for lasagna. 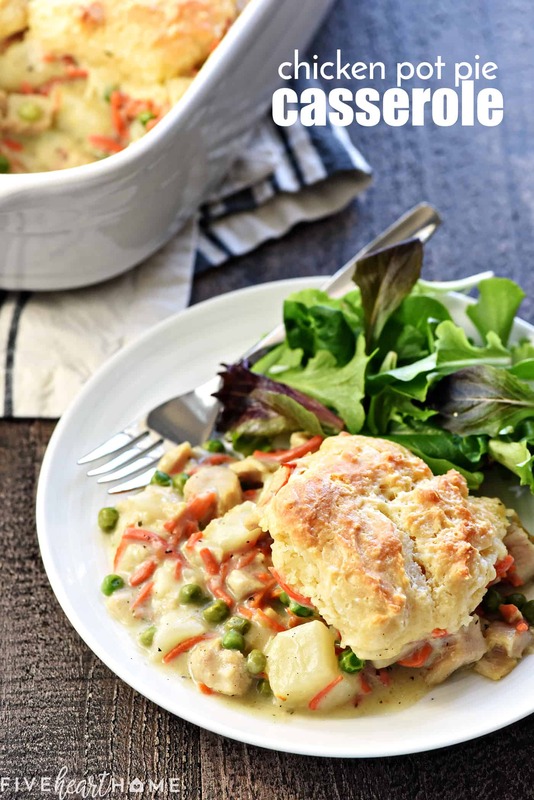 An Easier Version of Chicken Pot Pie…with Biscuits! But the main thing that sets this recipe apart it has no pie crust. I know, I know…that hardly sounds like an improvement at first glance. And I wouldn’t call it an improvement, per se, as much as an exchange for an equally delicious but decidedly different topping! 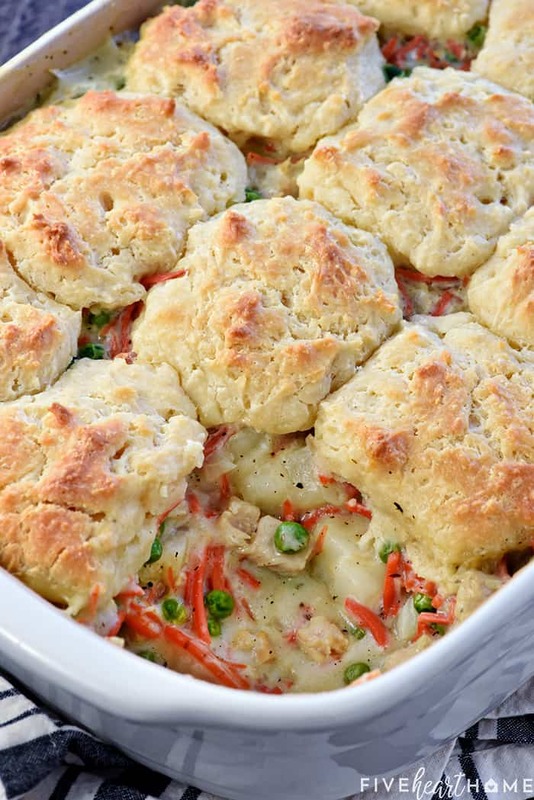 And that new topping isssss…biscuits! 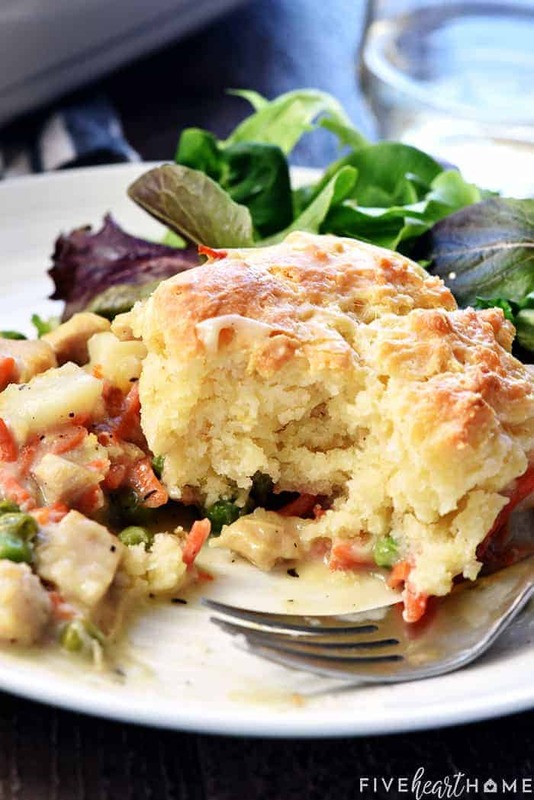 Tender, fluffy, homemade drop biscuits. Almost like deconstructed chicken and dumplings, I suppose. But I’ll tell you a little secret…I use the food processor to make the biscuit dough and it takes all of a minute or two. The chicken pot pie filling, on the other hand, takes slightly longer than a minute or two, but it’s still quick and easy to make. I actually made this Chicken Pot Pie Casserole with 4 cups of leftover diced turkey that I froze after Thanksgiving. You honestly couldn’t taste that it wasn’t chicken once it was combined with all of the other yummy ingredients. As for said ingredients, I started out by sauteeing garlic and several cups of carrots in olive oil for a few minutes until tender. I actually used a 10-ounce bag of coarsely shredded carrots to save time, but you could shred whole carrots yourself or dice them instead. Once the carrots cooked down, I mixed in the chicken (AKA, turkey) and then sprinkled the whole shebang with flour. And then, after stirring and giving the flour flavor a little time to cook out, I poured in the liquids…mostly chicken broth with some half and half for creaminess and a splash of white wine for depth of flavor. Once the liquid got all thick and bubbly, it was time to stir in the seasonings, the (already cooked) cubed potato, and the frozen peas. And then…the whole mixture got dumped into the baking dish! Next it was time for the fun part! As previously mentioned, I often use my trusty food processor to make homemade drop biscuits in a snap. So I simply pulsed together the dry ingredients, then pulsed in the cold butter, then pulsed in the buttermilk. And finally I scooped and plopped the biscuit dough onto the waiting chicken pot pie filling. Done! Easy! Yay! See how simple and straightforward this recipe is, y’all? And it’s so gosh darn delicious. 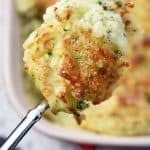 The filling is creamy and chunky and savory, and each forkful is accompanied by a soft, fluffy bite of biscuit. Mmmmmmm. 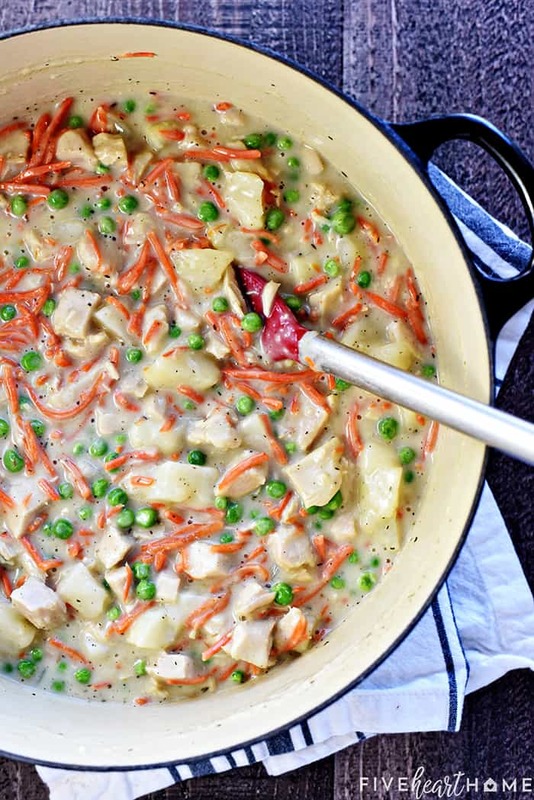 I hope your family loves this Chicken Pot Pie Casserole as much as mine does! 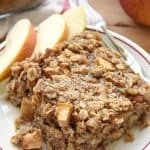 The filling will bubble up a bit during baking, so use a large rectangular baking dish with a capacity of about 5 quarts…the size of a dish you’d use to make a big lasagna. 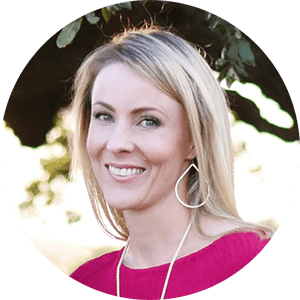 If you’re still worried about the size of your dish, however, place a large rimmed baking sheet on the rack under your baking dish to catch any potential overflow. 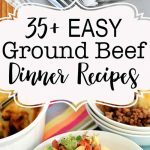 In place of the half-and half, you can use milk to lighten things up or heavy cream for extra decadence. Feel free to leave out the wine (or increase it!😉). 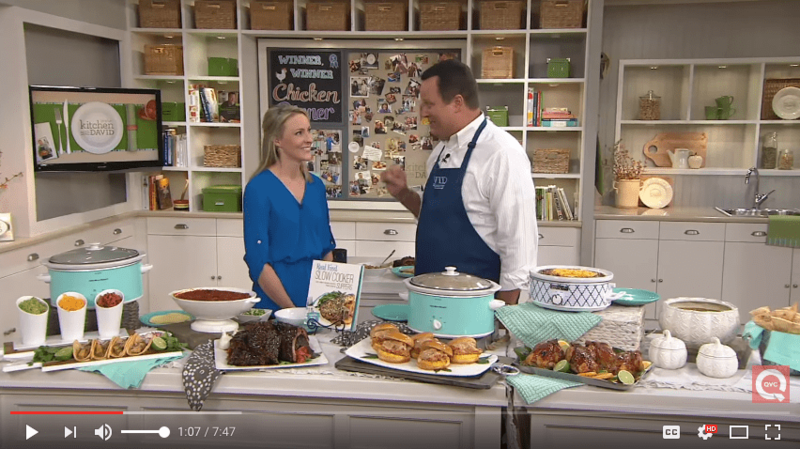 If you don’t have food processor, you can make the biscuit dough by hand…see the note at the bottom of the recipe. If you don’t have buttermilk for the biscuits, you can use regular milk instead. You may use whole wheat pastry flour in lieu of all-purpose flour if you prefer 100% whole wheat biscuits. The biscuit batter should be very sticky but not runny. If it ends up too sticky, pulse in a couple more tablespoons of flour. Adjust the oven rack to the center position and preheat oven to 375°F. Pour the olive oil into a large pot or Dutch oven set over medium to medium-high heat. Add the garlic and carrots and cook until tender, stirring occasionally, for about 5 to 7 minutes. Mix in the chicken. Sprinkle the flour over the mixture and stir to combine. Cook for 2 minutes, stirring constantly. Pour in the chicken broth, then add the half-and-half and the wine (if using). Stir to combine, scraping the bottom of the pot. Increase the heat and bring to a simmer, stirring occasionally. Continue to stir occasionally while the mixture simmers for a minute or two, until thickened. Stir in the thyme, garlic powder, onion powder, salt, and pepper. Adjust the seasonings to taste. Stir in the cubed potato and the frozen green peas, then remove the pot from the heat. Pour the mixture into a deep 4 1/2- to 5-quart baking dish (or a baking dish of a similar size/capacity); set aside. In a large food processor, pulse together the flour, baking powder, and salt until combined. Add the butter and pulse about ten (1-second) pulses until the mixture resembles coarse sand with some small pebbles mixed in. Add the buttermilk and pulse until all ingredients are fully incorporated. The dough should be very sticky but not runny. Use a large spoon to scoop and dollop blobs of biscuit dough onto the top of the chicken pot pie filling...I made four rows of three biscuits for a total of 12 biscuits. Carefully brush the top of each biscuit with some half-and-half. 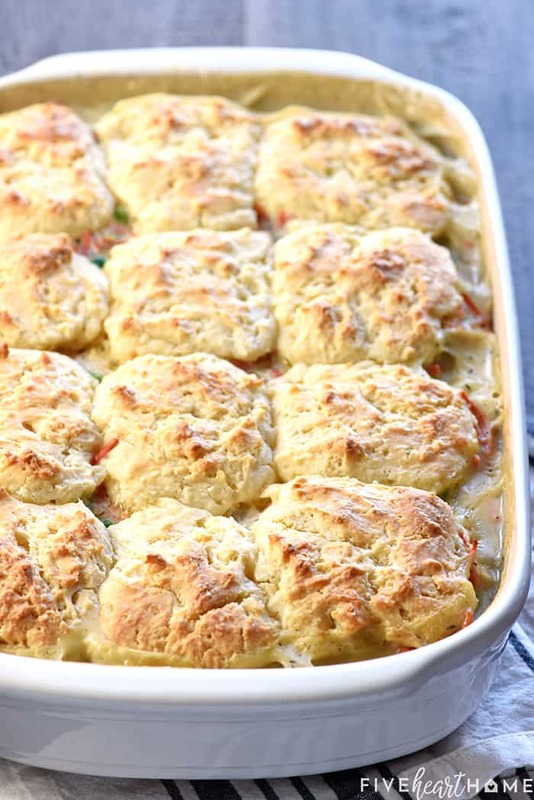 Bake for 35 to 40 minutes until the tops of the biscuits are golden and the filling is bubbly. Allow to cool for 5 to 10 minutes before serving. If you prefer to make the biscuits without using a food processor, simply whisk the dry ingredients together in a large bowl. Use a pastry cutter or two forks to cut the butter into the flour until the mixture resembles coarse crumbs. Stir in the buttermilk until combined before proceeding with the recipe. 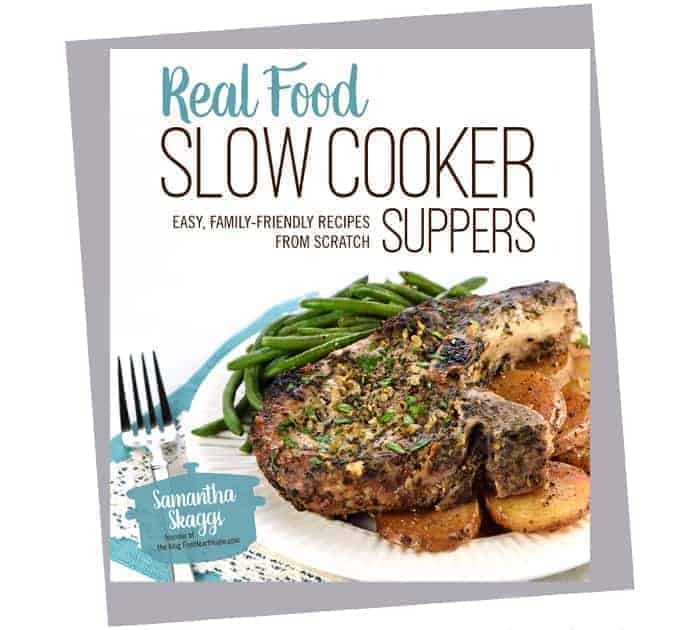 Ah, Samatha, how many times have I been wondering what I would feed our Saturday Supper crowd,only to find you had exactly what I needed? I even have frozen leftover turkey that needs using. 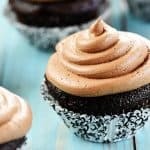 The photos make me hungry right now. Happy New Year to you and another thanks.